It was his second anti-Semitic pogrom in four years. On December 8, 1995, Al Sharpton incited the violent fire-bombing of the Jewish-owned Freddy’s Fashion Mart in Harlem, causing the deaths of Angelina Marrero, Cynthia Martinez, Luz Ramos, Mayra Rentas, Olga Garcia, Garnette Ramautar, and Kareem Brunner – the seven victims of the massacre. There was an eighth death, Roland James Smith, started the fire that burned down the store. Sharpton didn’t toss the firebomb, but the anti-Semitic and racial bias which came out of his mouth and out of the mouths of others while in his presence, produced the massacre as assuredly as if the fire was set with his hands. Smith’s mistake was listening to and believing Sharpton’s hatred. Smith had been part of a group of picketers, led by Al Sharpton , head of the National Action Network and Morris Powell , leader of the 125th Street Vendor’s Association, who had been protesting the eviction of Sikhulu Shange, owner of the Record Shack who was subletting from Fred Harari, the Jewish owner of Freddy’s. The United House of Prayer, a large African-American church, was also a major landlord in Harlem. They raised the rent on Freddy’s Fashion Mart, a Jewish-owned clothing store which had operated from the same Harlem location for over 40 years. In turn, Freddy’s had to raise the rent on its sub-tenant, a black-owned record store. A landlord-tenant dispute ensued. As he has done so often in his life, Al Sharpton turned this non-racial economic dispute into a racial conflict. 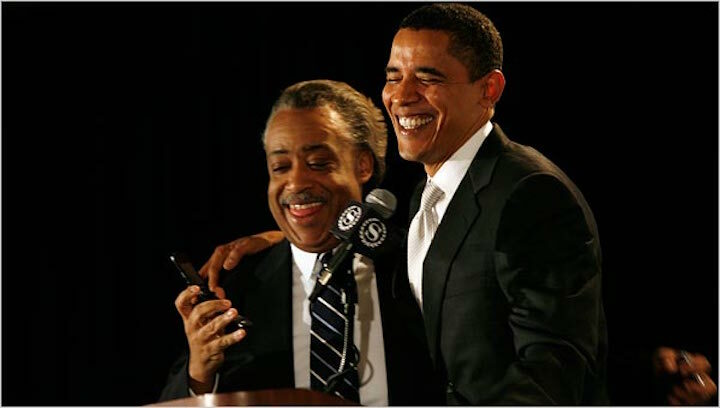 The Sharpton-led protests began in August and came to a head on the morning of Friday, December 8th. 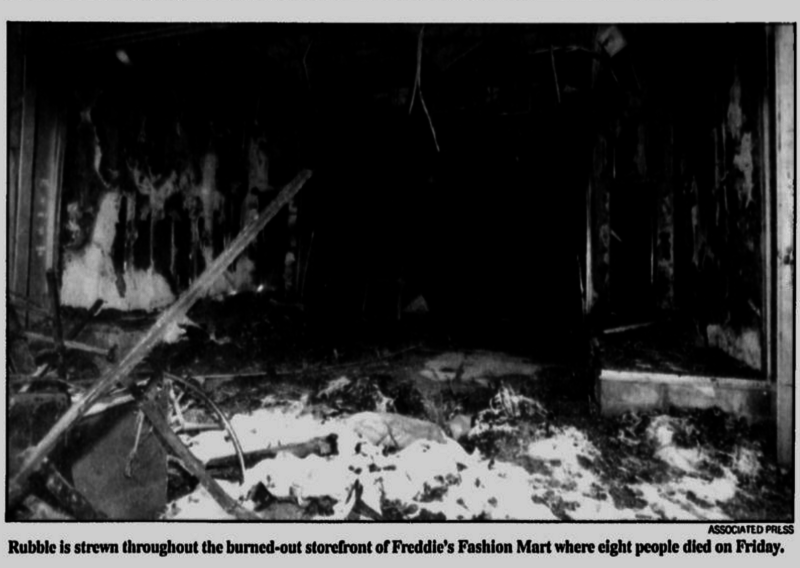 That’s when Roland James Smith, Jr. walked into Freddy’s Fashion Mart, pulled out a gun, ordered all the black customers to leave, spilled paint thinner on several bins of clothing and set them on fire — a fire that resulted in the deaths of Smith and seven others. The only African American left in the story was Freddy’s security guard Kareem Brunner, a 22-years-old, who was ordered to stay by the Smith. At the time, Sharpton “claimed” he wasn’t involved in the protests, that he was only present to mediate – but, the evidence suggests otherwise. Soon after the massacre, the Jewish Action Alliance, a New York-based civil-rights group, released audiotapes and transcripts of several of Sharpton’s weekly radio show. On those tapes one could hear Morris Powell, leader of the 125th Street Vendor’s Association, using racial and anti-Semitic language to encourage Harlem residents to boycott Freddy’s (sadly, the transcripts are still there, but audio tapes which were turned over to the NYPD no longer exists on the Action Alliance site). Learning from his Crown Heights experience Sharpton let others push the most of the anti-Semitic hatred, but, it was all done on his show. 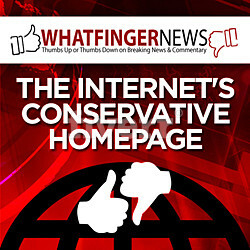 “Reverend Sharpton is on it. We have made contact with these crackers. We don’t expect a lot out of them. They haven’t seen how we feel about anything yet. We are going to show them. (…) They think they gonna drive this man out of business, they gotta be out of their minds. We are not gonna stand idly by and let a Jewish person come in Black Harlem and methodically drive black people out of business up and down 125th Street. If we stand for that, we’ll stand for anything. Which we’ve been doing. I am saying to the Jewish community and specifically to Abraham Foxman, that you come out and utter a word, accusatory remark against Reverend Sharpton, Jesse Jackson, Donna Wilson, Reverend Shields, or Gary Byrd, we will boycott you and nobody loves money any more than the Jewish people. Thank you. In court papers filed the day before the fire and reported in the NY Times, Harari and two of his employees described weeks of protests outside the clothing store. Harari said customers going into Freddy’s were spat on and cursed as “traitors” and “Uncle Toms.” Some protesters shouted, “Burn down the Jew store!” and simulated striking a match. On December 8th one of the protesters, Roland James Smith Jr. listened. He burst into Freddy’s, shot four employees point-blank, and poured a gas can out on the floor. Smith then ordered all the African-Americans, except for Kareem Brunner, to leave the store before lighting the fire. He criticized NYPD investigators for quickly linking the fire to the protesters. But, the police evidence, which included the tapes from the Jewish Alliance, don’t back him up. After first telling the press “What’s wrong with calling someone a white interloper?” he apologized for using that term. He never apologized for the Jew-hatred broadcasts on his radio shows and spoken at the rallies he helped to organize. He continues to deny that the demonstrations had anything to do with the fire-bombing. Al Sharpton has never acknowledged his role in the Freddy’s massacre, nor has he ever apologized (even though his actions/speeches, etc. were caught on tape). In the 23 years since Freddy’s, Al Sharpton hasn’t changed a bit. Remember the controversy surrounding the Duke lacrosse team? Without any facts, Al Sharpton declared that these “rich white boys” had attacked a ”black girl,” and he warned that, if arrests were not made immediately, there would be no peace. He further claimed, “this case parallels Abner Louima, who was raped and sodomized in a bathroom [by a New York City police officer] like this girl has alleged she was…. and just like in the Louima case, you have people here saying she fabricated it.” It was later proven that, indeed, she had totally invented the story and all charges against the defendants were dropped. In the recent cases of Trayvon Martin and Michael Brown, Al Sharpton falsely declared the shooters both racists and guilty without seeing any evidence. Apparently, the “Reverend” Sharpton never heard of the 9th commandment, “Thou shalt not bear false witness against thy neighbor.”Sharpton breaks that false witness commandment pretty often. Perhaps he believes God was being literal when he said: “against thy neighbor.” Maybe Sharpton believes it’s okay to make false charges against people who live outside his neighborhood. He has made a career of inciting riots by falsely accusing people of crimes when a true man of faith would not have incited violence but called for peace. What has changed in the intervening 23 years is that Sharpton has become a darling of the media, who never mention his history of race-baiting and his lack of atonement. He’s become an adviser to President Obama and other politicians who would never sit down with others with a similar history, like David Duke, for instance. But then again Sharpton and Obama have a similar opinion of Jewish people.